In our counseling work, we frequently direct people to various resources available to help with the variety of struggles that life brings. There are excellent books that touch on the subjects involved. Here is a list of titles and authors that compiled over time covering a variety of topics with which people typically struggle. 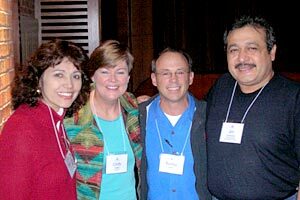 Hurt People, Hurt People – Wilson, Sandra D.
Jim and Marlene Campana with Donald M. "Bubba" Cathy, Senior Vice President, Chick-fil-A, Inc and his wife, Cindy Cathy at the Marriage Commission meeting on Nov. 30, 2006. Seminario para Matrimonios ¡Familias Saludables! En Octubre disfrutamos un seminario muy especial en nuestra iglesia. Los ministros Jim y Marlene Campaña presentaron un seminario a través de su involucramiento en "Marriage Savers" (http://www.marriagesavers.com/), un ministerio diseñado para fortalecer y aún salvar matrimonios. Fue todo un día Sábado con muchas parejas participando. El enfoque era cómo mejorar la comunicación marital, y terminamos con una renovación de votos con todas las parejas. Vimos un buen impacto como resultado. La gran mayoríade nuestra consejería en la iglesia son parejas con problemas, y casi todos son parejas jóvenes con niños. Hemos decidido hacer todo lo posible para mantener al enemigo vencido en nuestros matrimonios, pues con familias fuertes somos mucho más efectivos en ministerio y todo aspecto de la vida. Hasta ahora no hemos perdido ninguna familia por divorcio y queremos mantener nuestro récord. Con tiempo comenzaremos grupos pequeños de apoyo para las parejas dónde puedan crecer en su relación. What is the Hispanic Healthy Marriage Initiative (HHMI)? The purpose of the Administration for Children and Families (ACF) Healthy Marriage Initiative is to improve child well-being by providing those who choose marriage for themselves with increased access to marriage education. Recognizing the research that indicates that two-parent, married families represent the ideal environment for raising children, Congress included marriage, family formation, and fatherhood as key elements in the PRWORA of 1996 (welfare reform legislation, TANF). The HHMI is a focused strategy within the Healthy Marriage Initiative. The goal of the HHMI is to address the unique cultural, linguistic, demographic, and socio-economic needs of children and families in Hispanic communities. Why is a focused strategy necessary for the Hispanic Community? Largest minority group. As of July 2003, the Hispanic community was the largest minority in the United States with 39.9 million Hispanics comprising 13% of the population. The Census Bureau projected that by 2020 the Hispanic population will be nearly 20% of the U.S. population. Hispanics have the highest birth rate. In 2000 the birth rate for Hispanics was 96 per 1000, compared with 69 for Blacks and 57 for Whites. Highest teen pregnancy rates. The teen pregnancy rate for Hispanics is 69 more per 1,000 than the national average. Hispanics have had the greatest rate of increase of out-of-wedlock births since 1995. 43.5% of all Hispanic births were to unmarried Hispanics in 2002. While the unmarried birth rate among Blacks dropped between 1995 and 2002, it grew by 3 percentage points among Hispanics during the same time period. Youngest median age. The median age of Hispanics in the U.S. is only 25 compared to 30 for African Americans and 38 for Whites. There are nearly 15,200,000 Hispanics in the United Sates that are 18 years of age or younger. Hispanic families are 200% more likely to live in poverty than White families. In 1999, nearly one quarter of Hispanic families (23%) lived in poverty and 30% of Hispanic children aged 0-18 lived in poverty.